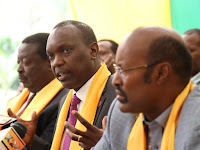 Monday February 11, 2019 - A vocal Jubilee Party MP from Central Kenya has opposed calls for the removal of the presidential term limits. On Friday, Wiper Democratic Movement party leader, Kalonzo Musyoka, asked for the removal of presidential term limits to allow President Uhuru Kenyatta vie for the presidency for a third time in 2022. But appearing in an interview on NTV on Sunday, Ndaragwa MP, Jeremiah Kioni said Uhuru shouldn't be handed an extra term because he will be 'too tired' to deliver. “Beyond 10 years you are not likely to be very useful to people, you are likely to have used up all the energy you had for that kind of position," Kioni said. The lawmaker noted that there was a lot of wastage in both the County and national Governments due to unnecessary duplication of roles which must be addressed. Kioni, who was the Amani National Congress (ANC) party leader, Musalia Mudavadi’s running mate during the 2013 polls, said he will only back constitutional changes if they are aimed at lessening the taxpayers' burden. “There are too many positions representing the same people," he said.